I’ve never been a true comic book store aficionado, although I have spent plenty of money at comic book stores that also did hobby gaming events. Many of the stores I’ve played games in have been shrines to the Big Two, with rows and rows of Batman or X-Men comics, and not much else. Image has really been taking these “Big Two stores” to task. At this point, you’d be a fool not to be carrying Image’s comics. From The Walking Dead to their wave of creator owned content like Saga and Chew, Image has slowly been gaining market share with great comics. The Wicked and The Divine seems to follow in the stead of other creator owned work from the company. 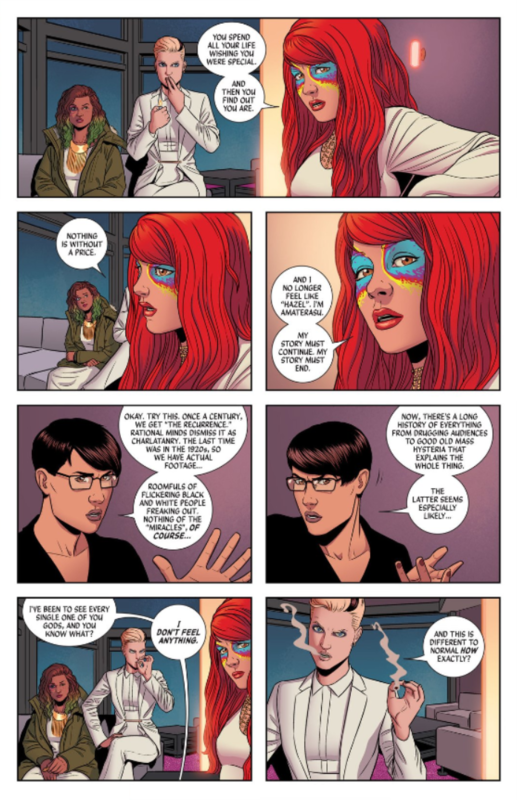 From what I gather, Kieron Gillen and Jamie McKelvie, the creative team behind the comic, have worked on a previous title, but this is my first time experiencing their work. The Wicked and The Divine follows a young girl Laura who is obsessed with Amaterasu, a goddess of The Recurrence. Every 90 years, gods wake up in the bodies of teenagers, to live 2 years, and then die again, repeating the cycle ad infinitum. Clearly The Wicked and The Divine has a road map, and knows where it is taking us – the first issue, which serves to pique your interest, has a definite ending in mind. From the initial setup of the comic, we know that the gods die, and must die, and will die. The question is how, and when, and what happens along the way. The mythos already seems well established in the first issue. I’m wondering who the other gods are, and what their roles were be. I’ve always been a sucker for mythology of all types, so this plays right into my tastes. I love how this comic plays with the ideas of pop culture; these gods have a little more than 15 minutes, but they are an embodiment of the quick and dirty “this is your icon now” fame that permeates our culture. 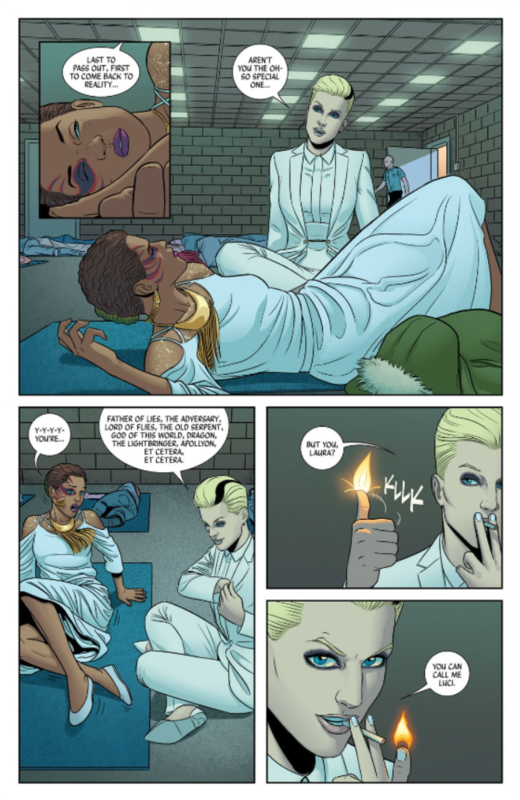 The Wicked and The Divine recognizes the way that fans interact with artists in the now – through cosplay and tumblr fanzines, and brings that to the forefront. Gillen is also working with pop music in the background of this comic- Lucifer bandies about with Beatles lyrics and David Bowie is mentioned. 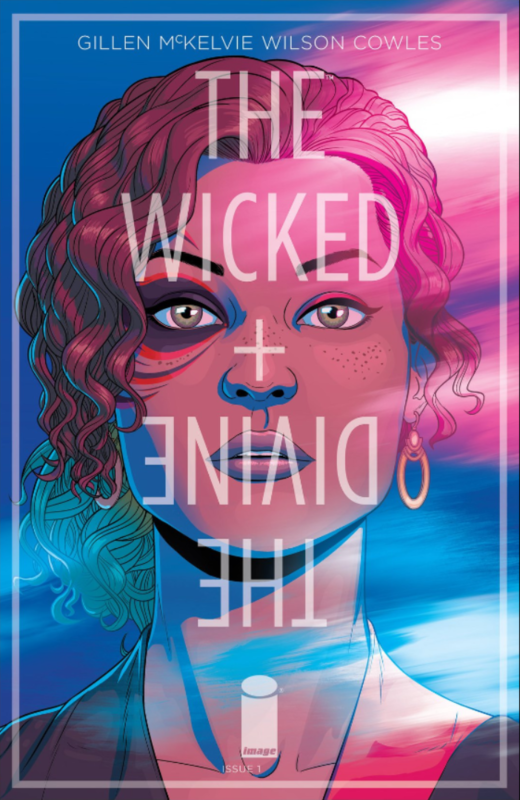 I don’t think that this is a comic about pop music, but The Wicked and The Divine is definitely willing to try out the themes of pop and take them out for a spin. The true selling point in The Wicked and The Divine is how well the story and characters are blended. McKelvie’s Lucifer, once seen, is the only version of Lucifer that makes sense to me now. The art is spectacular and clean; the colors are vivid and intense. The whole reading experience is intense. I’m not sure how this comic stands up to the test of time, i.e. how it reads in 20 years, but I don’t think that it particularly matters. The Wicked and The Divine #1 encapsulates fame and fandom right now, and it’s a great first issue. I’m looking forward to #2.